HE CALIFORNIA EMPLOYMENT DEVELOPMENT Department (EDD) is part of a statewide collaborative network that includes employers, community-based organizations, educators, state and local government agencies, and training providers. This network has employment and training services and programs available to qualified job seekers including: laid off workers, youth, workers looking for better opportunities, veterans, and individuals with disabilities. EDD services and information are at no cost to the workers. Visit your nearest Americaâ&#x20AC;&#x2122;s Job Center of CaliforniaSM (AJCC), to get information on job search training. 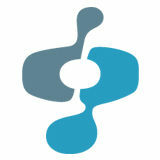 To find the nearest AJCC job center visit edd.ca.gov/Office Locator and ask to speak with an EDD representative. 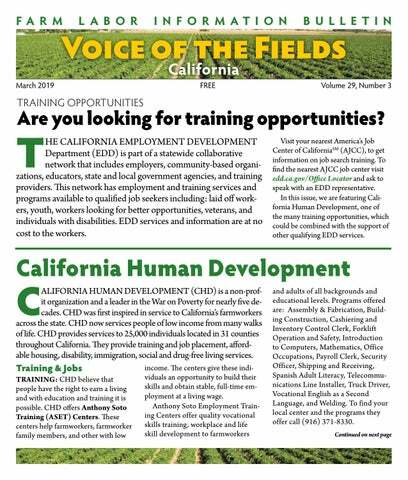 In this issue, we are featuring California Human Development, one of the many training opportunities, which could be combined with the support of other qualifying EDD services. CHD Continued from page 1 Who is Eligible? REFERRALS & STUDENTS ON ASSISTANCE CHD case managers located in 12 field offices, along with government agencies, refer many of their students. Those who qualify receive subsidized tuition and financial aid. The best way to see if you qualify is to call the CHD field office closest to you and speak with a case manager. ANYONE INTERESTED IN NEW SKILLS CHD’s training is available at competitive rates to anyone seeking new skills and greater earning ability. Backed in part by government grants, CHD programs are exceptionally robust and deliver excellent results. In fact, more than 80% of their graduates find and keep work in their field of training! JOB PLACEMENT Whether you’re looking for a job or looking to hire, CHD serves as a central hub in each of their locations to connect well-trained, qualified and motivated employees with local employers. Employment Services ASSISTANCE TO BRIDGE THE GAP When necessary, housing, child care, and other living assistance is arranged for qualifying individuals who are in crisis and to bridge the gap during training. AT RISK YOUTH In San Joaquin County, teens struggling in school and in life get a hand up to succeed. Academic and career guidance, life skills workshops and work experience opportunities encourage them to finish their education. DISASTER RELIEF Help to pay rent and put food on the table, as well as temporary employment for those who have lost their jobs, are provided following catastrophic situations. an honest days work at fair pay. And it’s more than that; their Centers help workers to build a better life for themselves and their families. Whether that means emergency care such as food, health care and clothing or assistance to improve employability through English-language classes and job skills training; they are proud to be of assistance and welcome the day workers to the neighborhood. Affordable Housing CHD offers over 500 units of affordable housing in towns across Northern California, including Fairfield, Stockton, Yuba City, Napa, St Helena, and Calistoga. Accommodations range from: singlefamily houses with lawns and yards; one, two, three, and four bedroom townhomes and apartments; and dormitorystyle living for seasonal farmworkers. FARM LABOR CENTERS Calistoga 707.942.9279 St. Helena 707.963.7496 Napa 707.265.7629 To get more information regarding other resources they offer through immigration, disability, social and drugfree living services call (916) 371-8220 or visit the CHD website at www. californiahumandevelopment.org. DD WOULD LIKE TO INVITE YOU TO VISIT the Migrant and Seasonal Farmworker webpage through the EDD website at edd.ca.gov/Jobs_and_Training/Migrant_and_ Seasonal_Farm_Worker_Outreach_Program.htm . This page provides resources for Migrant and Seasonal Farmworkers ensuring they receive the same services as other California Workers. the America’s Service Locator toll-free at 1-877-872-5627 (TTY 1-877-889-5627) to find your closest center. For employment services related complaints, contact the EDD Monitor Advocate at 1-866-289-8356 or madvocat@edd.ca.gov Program Services. HE CASH-BACK California Earned Income Tax Credit (CalEITC) is designed to put money in the pockets of low-income working people. You can use the money for anything; clothing, food, school supplies, electric bills, etc. For tax year 2018, families earning wages or self-employment income up to $24,950 may qualify for CalEITC. How do I claim the credit? You claim the credit by preparing and filing a California tax return. You can do it yourself or get free help. What if I already filed my state return and didn’t claim the credit? If you think you may qualify for CalEITC, you may amend your return. You can do it yourself or get free help. Get free help to prepare (or amend) and file your tax return. Beginning in late January and running through Tax Day, April 15, 2019, find free tax help at a location near you CalEITC4Me.org. HE EARNED INCOME TAX CREDIT, EITC or EIC, is a benefit for working people with low to moderate income. To qualify, you must meet certain requirements and file a tax return, even if you do not owe any tax or are not required to file. EITC reduces the amount of tax you owe and may give you a refund. working for someone or from running or owning a business or farm and meet basic rules. And, you must either meet additional rules for workers without a qualifying child or have a child that meets all the qualifying child rules for you. Earned Income Limits The tax year 2018 earned income and adjusted gross income (AGI) must each be less than: Investment Income Limit Investment income must be $3,500 or less for the year. The H-2A temporary agricultural program allows agricultural employers who anticipate a shortage of domestic workers to bring nonimmigrant foreign workers to the U.S. to perform agricultural labor or services of a temporary or seasonal nature. The H-2A employers must demonstrate that qualified U.S. workers are not available for the job and the employment of temporary foreign workers will not adversely affect the wages and working conditions of U.S. workers similarly employed. Preference in hiring will be given to qualified U.S. workers before employers are allowed to bring in foreign workers under the program. www.LaCooperativa.org Published monthly by: La Cooperativa Campesina de California 1107 9th Street, Suite 420, Sacramento, CA 95814 This product was funded by the U.S. Department of Labor’s Employment and Training Administration. The opinions expressed in this product are exclusive of the authors and does not necessarily reflect the official position of the U.S. Department of Labor. This product is copyrighted by the institution that created it. Internal use by an organization and/or personal use by an individual for non-commercial purposes is permissible. All other uses require the prior authorization of the copyright owner. Content produced by ALZA Strategies, a full-service strategy firm that offers quality media relations, crisis communications, public affairs services, and expertise into the growing Latino market.